THE senior economic ministers in the O’Neill Government should resign immediately to save face after concealing the contents of a recent country report by the International Monetary Fund on PNG’s worsening economic status. 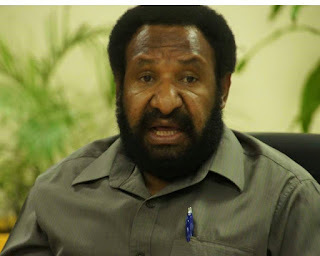 Opposition Leader Don Polye said this when asked by the media during a press conference to comment on the report concluded in November and given to the Government in December. Mr Polye said the Government’s move to hide the Bank’s report as a desperate move to hide the facts from reality on the economic condition of the country. He said economic Ministers like Treasury Minister Patrick Pruiatch, Finance Minister James Marape, National Planning Minister Charles Abel and the Prime Minister Peter O’Neill should resign immediately in shame. He said financial institutions like the World Bank and the International Monetary Fund provide reports and recommendations for a progressive economy recovery package when economic crisis are anticipated. He said the country’s economy has been mismanaged and the country was facing cash crisis as a result of unbudgeted and unwise spending and repayment of excessive loans. He said the country does not belong to one person to misuse and mismanage and hide and conceal important independent reports based on the country’s economic performance like the IMF report. Mr Polye said IMF and World Bank provide structural adjustment options to safeguard the country’s economy that has become stale. He said if those reports are not addressed the banks provide loans, so it was important to table such reports. “The honest way is to table the report. If the Prime Minister cannot table the report then he should resign for mismanaging the country’s economy. “He is not a fit and proper person to manage the economy even though he is an accountant. He does not have any financial solution to bail the country. He is only good at getting more loans and spending and spending centred in one centre and awarding contracts to a handful of business cronies,” he said. Meanwhile, Treasurer Patrick Pruaitch said the Government will table the report after some issues with the Treasury Department and the Bank of PNG was resolved. He said records indicate that only two or three countries have hidden IMF and World Bank reports as they go into recession.